Griffen Saul and his father, Brad Saul, attend a Cub game at Wrigley Field. LINCOLN PARK — Thursday and Friday, hundreds of Chicago high-schoolers will suddenly have to deal with disabilities like deafness, the inability to speak, ocular impairment and various physical maladies — as well as how other people deal with their limitations. 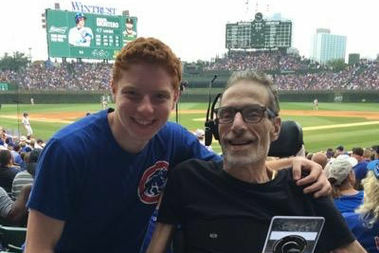 That's the concept behind a citywide disability awareness campaign launched by Griffen Saul, a Lincoln Park High School senior whose father, Brad Saul, died almost exactly a year ago after dealing for more than 20 years with advanced multiple sclerosis. "It really is a tribute to my father," Saul said Wednesday. "I hope through this campaign to not only expand people's empathy, but help create a society where disability etiquette isn't just the exception but the norm." 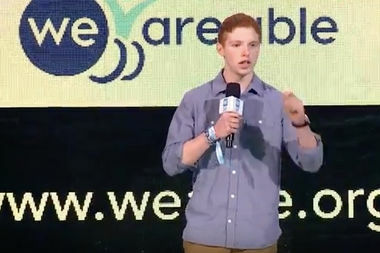 Griffen Saul's "We Are Able" inspirational speech has made its way to YouTube. Thursday and Friday, more than 300 students at Lincoln Park High School, Whitney Young Magnet High School, Lane Tech College Prep, Francis Parker, the University of Chicago Lab School, Steinmetz College Prep and Wells Community Academy High School are expected to "live" a day with a disability. The concept is simple enough, as with high-school couples carrying around a sack of flour meant to be a baby, but it developed an additional component after Saul tried to round up support from Commissioner Karen Tamley and Deputy Commissioner Joseph Albritton of the Mayor's Office for People With Disabilities. They suggested adding an educational element in teaching "proper disability etiquette." "That was something that really resonated with me dealing with my father's experience," Saul said. He'd seen "people's inability and lack of knowledge in properly communicating with someone with disabilities." At the end of the school day, those who take part will share their experiences and new perspectives on the difference between feeling true empathy and merely offering sympathy. The dates were selected as they fail immediately in front of International Day of People With Disability, on Saturday. Not coincidentally, Sunday will be the first anniversary of Brad Saul's death. "It's been a long, long road, but I'm very thankful for what my dad has taught me," Saul said, "and I'm able to kind of carry on his legacy through this event." A Lakeview resident, Saul began the campaign just trying to get friends to take part, but this being Chicago he knew kids not just at Lincoln Park but at Lab, Parker and Lane Tech. His sister carried the message to Whitney Young. "It started from there and kind of just spread," Saul said. "It was really word of mouth and then social media." Participants will also get a chance to post reflections on Saul's We Are Able website, connected to a nonprofit he formed on overcoming disabilities. He himself has also delivered inspirational talks that have wound up on YouTube. More recently, he added, he's expanded his concept of what We Are Able means. "We are all able, all of us, to accomplish our dreams and achieve great things, despite challenges," Saul said. "It's about life in general." Saul is an International Baccalaureate student at Lincoln Park. "It's a lot of fun managing all that work with this campaign," he said without a hint of teenage sarcasm, "but I don't regret any of it." He's got a few colleges in mind, but has applied for an early decision at Brown University. "I was happy the way it turned out and hope it grows in the coming years," Saul said of the campaign. "I intend to carry this through college and make this a go not just in Chicago but on a national level and maybe one day global." For more neighborhood news, listen to DNAinfo Radio here.